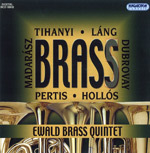 The Ewald Brass Quintet has been formed in 1996 in the frame of the chamber music lessons at the F. Liszt Academy of Music /State University/ of Budapest. Their primary aim is the realization of the traditional together music making on brass instruments. 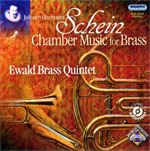 On the first CD of the ensemble one can hear compositions by Bach, Haydn and Brahms and in addition European madrigals. The transcriptions were made by Roland Szentpáli. 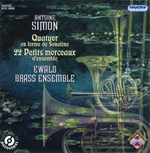 This is a unique range of tones, as in the year of 2001 the developmnent of the brass instrument and their complete sounding made it possible to perform the works composed originally for string instruments on brass ones as well. This CD is a result of a work of 5 years. We have proved our professional talent in the frame 10 competitions. From September 2000 the ensemble is playing on new instruments made by a master, which we could obtain with the help of the sponsors named JA-Musik of German interest and by the company Wenzel Meinl. In November 2000 we were given the Artisjus prize for the excellent interpretation of the Hungarian contemporary music. With the cooperation and collaboration of Roland Szentpáli and with the professional and freindly help of the ensemble, and in addition with Mr.László Szabó /associate professor/, as artistic leader, with the helping hand of Mr. Gusztáv Bárány musical regisseur, sound engineer, Mr. Mihály Horváth sound technician as a result of our common work a new brass chamber music CD has been ready, under the title "Chamber Music". The recording were made in the big Concert Hall of the F. Liszt Academy of Music. The graphic works were made at the "Gramy Records", according to the plans of Rita Balogh.